When it comes to home fragrance, my philosophy is ‘burn baby, burn’, which is to say that I really love a fragranced candle. At any given time I have at least four scented candles on the go – not all at once, obviously, that would be cacophonous, no, what I mean is that I have about four on rotation, switching between them depending on my mood. 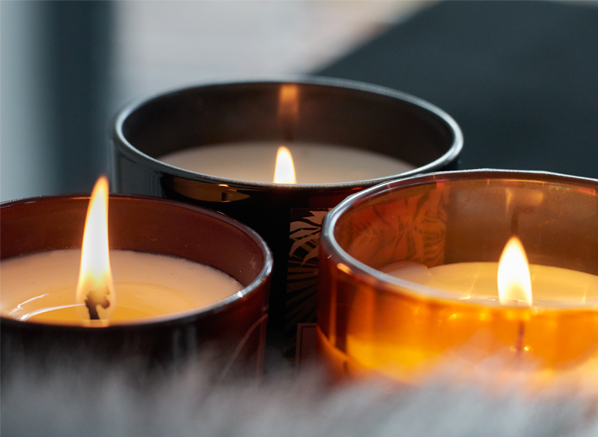 I have different candles in different rooms – calmer, soothing scents in my office to aid concentration, and warmer, cosy scents in my living room, for example. Endless possibilities! Burning a scented candle really sets the mood one wants in a room and it’s a great way to add a bit of extra colour to the environment. They are more than just tools to make your house smell better, they really do change the atmosphere, inviting people in and beguiling the senses. In this edit I have pulled together three of my favourite candles this season, organising them by mood and room so you can pick the perfect fragrance candle for your home. I don’t know about you, but I have to have one room in my home that is mine – my sanctuary that I can hide away in and completely chill out. For me, that place is my home office. In my study, I like to burn a candle that is cool and calm – one that can inspire me by not messing with my brainwaves. Something that is intellectually stimulating but not overwhelming. For me, that candle is the 2 Candle by Comme des Garçons. Replicating the brand’s iconic, abstract floral, 2 as a candle burns with a silvery sheen evocative of Japanese ink. It’s soft and soothing, but also intriguing, leading one to think about what it is they’re smelling. I burn this in my office and it envelops me in a wave of thought – perfect for a creative space. Burn in your home study to create a soothing and focused mood. 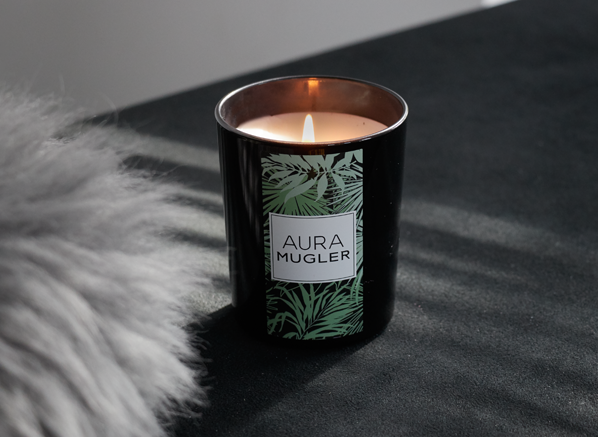 MUGLER candles are perfect for those who want to have a statement fragrance in their home and few candles make more of an impression than Aura. Inspired by the latest MUGLER odyssey, the Aura Scented Candle creates the impression of a lush forest on a faraway planet. Juicy rhubarb and orange blossom bring a misty, rainforest feel, whilst smoky tiger liana and vanilla provide contrast and warmth. The Aura candle brings to mind images of bioluminescent flora, soaking one’s home in an ambient glow that is energising, vibrant and completely, entirely extra-terrestrial. Burn in your living room to create a vibrant and energised mood. It is important that a fragranced candle has a strong, but not overpowering fragrance that has a generous throw. It’s also important that it looks nice too and my favourite candles are those that manage to be both a delightful fragrance experience and a beautiful decorative object. 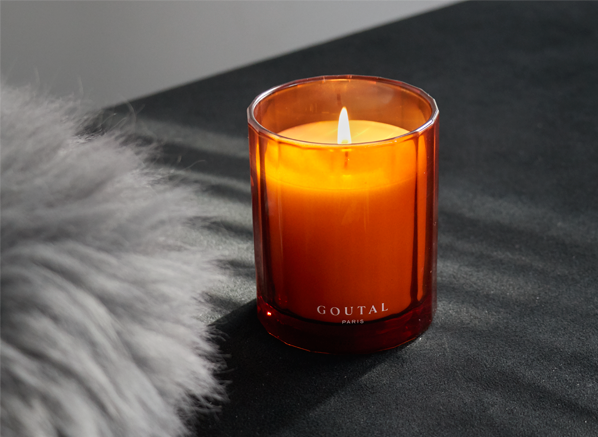 The home fragrance options from the recently rebranded GOUTAL Paris certainly tick both the fragrant and aesthetic boxes. My favourite from their new collection of candles is Un Air d’Hadrien, an ode to the brand’s signature fragrance, that sends forth glowing waves of lemon, bergamot and cypress. It paints the picture of a warm day on a Tuscan hillside, turning one’s house into a beautiful vista that is almost as glorious as the fluted orange glass jar the candle sits in. A beautiful object all round. Burn in your bedroom to create a warm and exotic mood. This entry was posted on Wednesday, October 3rd, 2018 at 9:30 am and is filed under Candy Perfume Boy, Fragrance, New products. You can follow any responses to this entry through the RSS 2.0 feed. You can skip to the end and leave a response. Pinging is currently not allowed.